I'm lovin dyeing this fibre, its so easy to work with, takes the dye really well and spins up lovely. Still using my drop spindle i dont know if i'll ever use a wheel. This first one i dyed 2 different lots. One in pink and green and the other in purple and pink and then plyed them both together. I really like the way it turned out. 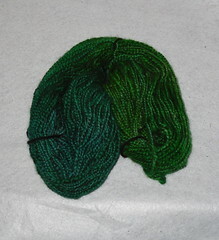 This one was a dark grey natural Gotland that i over dyed in a blue-green and light-green and this is how is came out. A bit darker than i thought but it was pretty dark to begin with so it still took the dye really well. This is Romney Fibre that i spun up on my drop spindle, in its natural white color and then Dyed in my favorite colors after. That is the first time dying and spinning this way i usually dye first and then spin. Not sure why but i love this romney fleece, its so easy to work with and i love those colors. 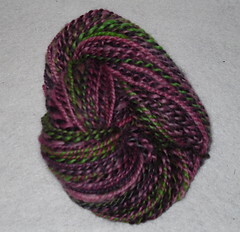 I was inspired the other day to do some more spindle spinning by Jude (judelicious) on flickr. She's just learning to and her yarn is gorgeous. I had to spin some myself to and this is hand washed ,dyed ,carded and spun on a spindle merino x borderleicester multi-colored and plyed with pink merino. I really love the colors and my favorite at the moment is all greens mixed with all pinks. Very old world and gorgeous.